Some tap water is safe to drink, however it is recommended to buy bottled water. Six liter bottles can be purchased for as little as 90 LEK (i.e. 65 EUR) from local markets. Please tell me when SARRIS ferry leaves Saranda for Corfu in July. There are no roulette wheels in Saranda. There is a “casino” but inside is only digital fruit machines and pokies. 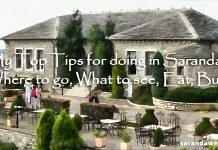 There are a number of places to play live poker around Saranda, but you’d have to get to know some of the locals and be invited to come and play prior to playing.